It is no secret a well executed home can sway the modern home buyers and of course, it takes a lot to bring such high level development in the market and push the Indian real estate market because at present there are ceaseless of projects in the market, but many of them fail to gain attention. According to the report, not all the builders are a fulfilling the needs of the home buyers, but few of them are superb in delivering the best projects that hold complete modern facilities to deliver a new age home where high security system, immense modern amenities and impressive designs and more adds extra importance to the project. Below we will discuss about the 3 leading Properties in Sohna Gurgaon (also known as South of Gurgaon) and these properties are formed with a high vision where it serves everything in its single project, so that home buyer and investors get top notch property in their hands. Sohna today is holding its excellent connectivity with NH-8 that further connects to IGI Airport, The Golf Course Road, Delhi border, biggest IT hub and more. So because of its approachable distance it holds potential for robust developments and that is why today Leading Indian Real Estate Builders are coming up with new developments in residential and commercial hub and this way it opens a path for the investors and home buyers to invest in best properties that give them high return over investment (ROI). So Sohna location can be the best location for investment point of view that can give its wide jump after few years. As far as the price is concerned, it is still affordable in comparison to Gurgaon & Delhi and just because it appeals the investors and home buyers, so more builders are investing their efforts in Sohna to bring high level property that is not less than any prime property. The crux of the matter is if you are looking for lucrative properties, then 100 per cent this location will serve its mountainous advantages after every interval. Let us grab the three leading properties in Sohna Gurgaon by the finest builders that create a leeway to climb the best experience. One of the highly known builders Central Park offerings its new level housing project “Central Park 3 Cerise Suites” and this project is offering serviced apartments with 2 BHK+ Study Floors on 180 Sq. yards plots option. You might feel that it has single configuration and that too 2 BHK, then do not go that side because this can be the best serviced apartments in Sohna as it gives active sports area, green zone and high security system and that means that the residents will get a complete home space to lead a happy time. By the way, serviced apartments are high in demand because this small size space has wide use where it can turn into a meeting spot for official work, a small family can have its personal use, right option for a single person and more. This well developed Central Park 3 Cerise Suites project is definitely your optimistic option for right return over investment. This is high in demand because of its high use and if you will have a property like this, then it will serve you high monthly income and a place for great use. 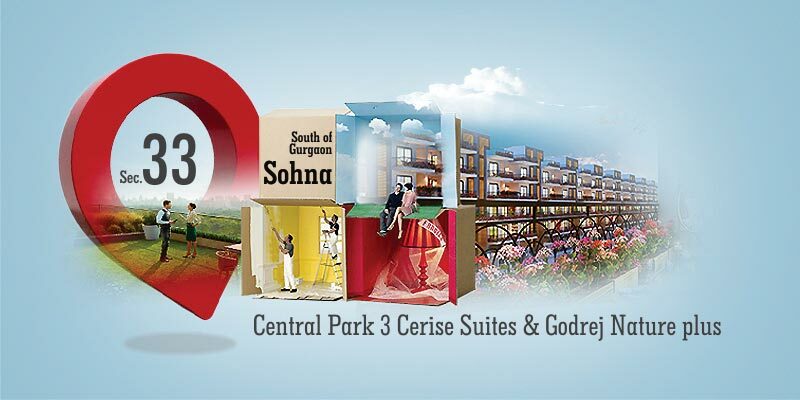 Location- Central Park 3 Cerise Suites has its right position in sector 32 & 33 Sohna that connects you well with all the leading hubs and many robust developments taking place that creates a right realm for the people. So all in all, it is a goodness of perfection, newness and innovation, so if you are looking for a mini investment with impressive benefits, then this is the right one. Is it often that your kids poking you all the time to get a new home? I think yes, they poke you all the time and I think this has sabotaged your mind, so here all your worries will disappear because one of the well known builders Godrej Properties is offering its exceptional home space “Godrej Nature Plus” that gives world’s best experience because it has international security system, high modern amenities and attractive designs, all in all, it gives lavish living. So here at Godrej Nature plus you get the combination of 2 BHK and 3 BHK apartments and each of the unit is designed with planning to bring a good space holding privacy, peace and ventilation. USP’s- It has nature heaven with colour garden, fragrance garden, herb garden & butterfly garden altogether. It controls high security system- With bike patrolling, dog patrolling, bus shuttle service, face detection, burglar alarm options and this ensures that every resident live a fret free life with their families. Interesting designs and full planning, so Godrej Properties definitely added every aspect to the project, so that it maintains high level home space for the modern families. Lastly, it is planned in sector 33, Sohna that gives you its direct connectivity to social infrastructures and leading destinations. Yes, Godrej The Park Sohna is also an interesting option and no doubt, it gives immense greenery and according to the survey, the air quality of this area is far better than other areas, so you will live a completely healthy life here. For option- here you have 2 BHK, 2 BHK+ Private Deck & 3 BHK apartments and each of them is designed with high dimensions so that it meets the needs completely and let the residents enjoy the space. This The Park project is a part of Godrej Nature Plus Sohna, so you will get all the comforts like you are getting in the above project as it is a part of it. Location- It is obvious; this project is also situated in same sector 33, Sohna that gives you right and direct connectivity to all the important locations. So clubbing everything together, one thing is clear and that these options are perfect for investment and if invested, then for sure they will get its true result. 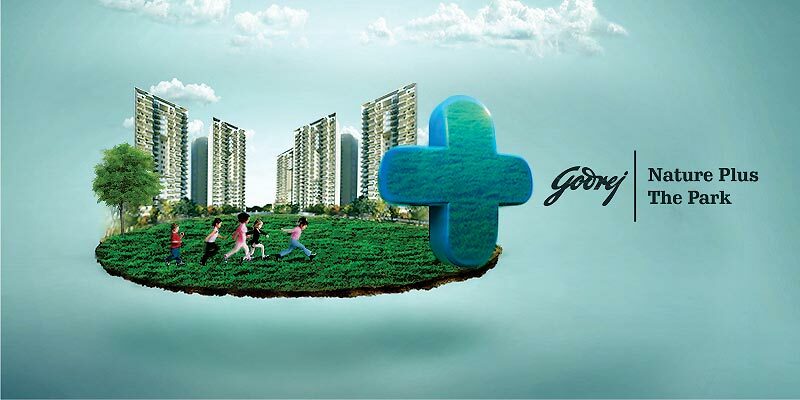 Is Godrej Nature Plus a Good Investment?